I've mentioned this project before (feels like a million times) and I am pleased to say it's now complete and brightening up our living room! Inspired by this project (and a huge empty wall space above our new tv), this past November we sat at a family dinner and brainstormed the words that define us...things that are important to us, qualities we aspire to show, things we do together. We narrowed it down to a list of eleven and then...I got to stitching! 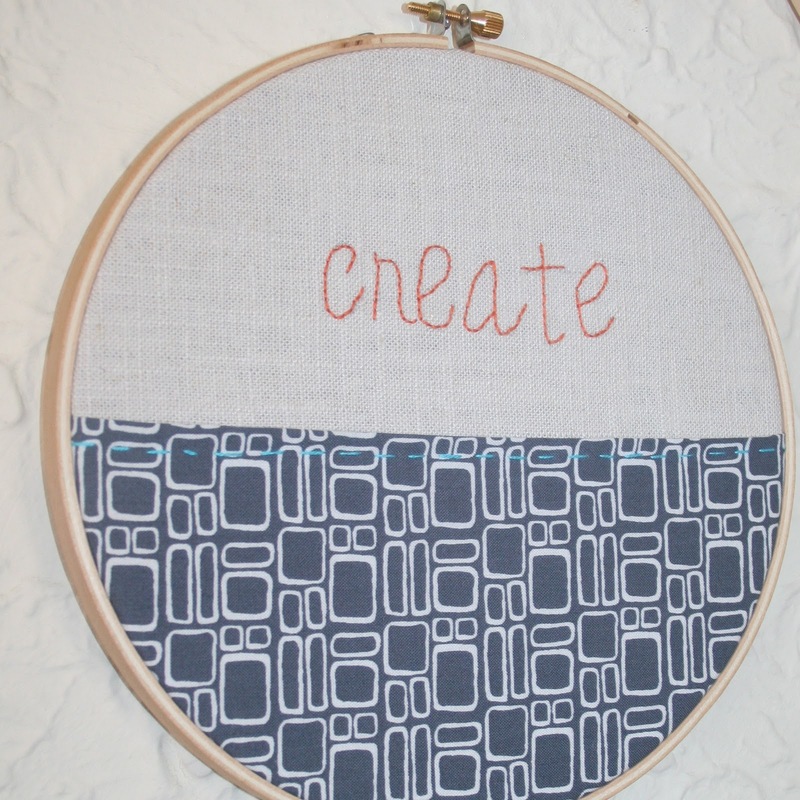 The center embroidery hoop features simple outlines of my kid's hands. This is a project I've done a couple times as a gift but never for myself. I love it! And here is the completed wall. I love the patterns & colors, the special words, the shapes & (random) layout, and that I made it myself! SUPER cute! wanna come to my house and figure out what to do on my living room wall? this is AMAZING!!! i love, love, love it!!!!!! everything about it! Maybe I should have "gifted" you and Leslie both with the "creative" pendant. HOLY COW!!! This is absolutely incredible. Seriously. WOW! And the outlines of their hands - priceless! seriously?! adorable! and when did you get the new blog look? it' awesome!! you never cease to amaze me, that is so super cool! I may also be a smidge jealous as I could never do that I don't think. Just love it! WOW WOW WOW! LOVE LOVE LOVE! U R very talented :) Carrie G.